Today in Masonic History we discuss Euclid. Euclid is often referred to as "the father of geometry." There is little that is actually known about the life of Euclid. He is believed to have been born sometime around the mid-4th century B.C.E. The only reference that is available on this comes form peers that reference him or those who were around him. This is considered odd by most historians since people who lived in time periods before, after and at the same time as Euclid have plenty of reference material written about them. This lack of information about Euclid has led some to speculate that he was actually a group of mathematicians living at that time and that the collection of theories that were provided by him, were actually provided by the group. The only historical references to Euclid as an individual were not written until 4th and 5th centuries A.D. Even Archimedes referred to him as "ὁ στοιχειώτης" (the author of Elements). Regardless of whether Euclid was an actual person or a group of mathematicians, Elements which was written and attributed to Euclid, is one of the most important books on mathematics, specifically Geometry. Elements was used for nearly 23 centuries to teach Geometry. It wasn't until the 19th century that, what is referred to as, non-Euclidean geometry started to emerge. For Freemasonry Geometry is a critical part of our symbolism. Euclid himself was written into the history of Freemasonry in the 14th Century Regius Poem which starts off talking about how Euclid trained that good families in Egypt in Geometry calling it masonry. In the poem, parents are worried that their children will not be able to find work and that they will not be able to support their children. They then ask scholars to teach their children. In the poem Euclid emerges as the greatest of the pupils and then teaches others in the ways of Geometry. 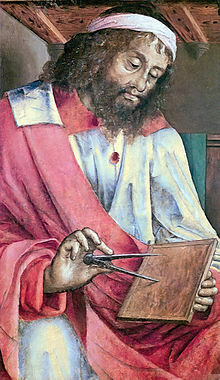 Euclid is believed to have passed away in the mid-3rd century B.C.E.